Vectis Refrigeration Ltd takes pride in keeping top Island businesses going even in the hottest weather. This is managed by an active maintenance program. Without proper preventative refrigeration maintenance, issues such as drain line clogs and the loose seals can compromise the efficiency of your equipment and drive up your energy costs. However, when your commercial refrigeration equipment is well maintained, it’ll run with greater efficiency and your energy bills will show it! As a business owner, you’ve invested a lot into your refrigeration equipment, so you want it to last as long as possible. By keeping your equipment in top shape with regular preventative maintenance, you can keep your appliances running for years to come. You take pride in providing the best product possible for your customers. However, if you are not taking care to keep your refrigeration equipment well maintained and properly cleaned, your customers may not be receiving top quality food and beverages. Because of their moist conditions, appliances like ice machines are highly susceptible to mold and bacterial growth and must be regularly cleaned to prevent it. Make sure your refrigeration equipment is safe to use all year long with regular preventative maintenance. When your refrigeration equipment breaks down, it isn’t just the cost of repair that you’re left with. It’s also the cost of lost product and lost business. When you schedule regular preventative maintenance for you refrigeration equipment, you can significantly reduce your risk of experiencing a costly and unexpected breakdown. When a professional refrigeration technician comes to service your equipment, they will do a complete performance check to catch minor issues before they get worse and alert you of anything that could potentially cause you to close up shop. 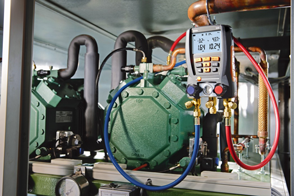 Vectis Refrigeration Ltd can offer yearly Planned Preventative Maintenance (PPM) programs which include two maintenance visits per year. Arranged with you for the time that suits you best. We normally recommend March & October typically. We offer businesses of all sizes PPM for their commercial Refrigeration and Air conditioning systems. Each PPM package is designed to meet the needs of the individual business and systems in place and ensure full FGas compliance. As part of every PPM package our Refcom certified engineers carry out scheduled visits to keep your system efficient and FGas compliant all-year-round. On your behalf we will maintain your FGas records to keep you legally compliant with FGas regulation. check for vibration/excessive wear and tear/insulation. Pricing is £150 per unit per year plus vat. This includes two service calls per year and includes labour and travel cleaning consumables. We also give discount for multiple units on a PPM agreement.